Best Travel Backpack Carry On – No More Damaged Luggage! A newbie traveler has a lot of questions. One of them is what bag could be a perfect choice for them. A bag, which could fit all of their belongings, toiletry, valuables. A bag to last. Experienced travelers prefer to take all of their belongings with them. Luggage may get dirty or damaged. Moreover, it will take a lot of time to look for it at the airport. When it takes you two or three flights to reach your destination, you might have to go looking for your luggage several times. And that is uncomfortable and distressing. Now, it’s time to find out what important things worth paying attention to are. As a rule, you may take your backpack into the cabin. There is room under the seat in the cabin, where you can put your carry-on backpack. Besides, there is an overhead locker for the same purpose. But each airline has its own rules. You just need to find out whether your bag is allowed as cabin luggage. If the dimensions of your carry-on backpack don’t meet the requirements of a given airline, you will have to check it in. Choose a backpack of required dimensions if you have a short layover on your way. Many backpacks are made of a durable material. Such a backpack could be rather heavy even when empty. The bigger a backpack, the heavier it is. Naturally, if you are going to take a four-person tent with you, several sleeping bags, a couple of blankets, you can hardly expect that your backpack will be lightweight. By the way, a water-resistant material is welcome. Many of carry-on backpacks can be transformed into a stylish suitcase. Not very big carry-on backpacks are versatile and could be used as a diaper bag or a bag for a weekend getaway. Whenever you go, this backpack will leave your hands free. So, you get a chance to hike or to take your baby’s hand. The main compartment should be roomy. Surely, pockets are meant for the best organization of your essentials. What question concerning pockets springs to your mind first? 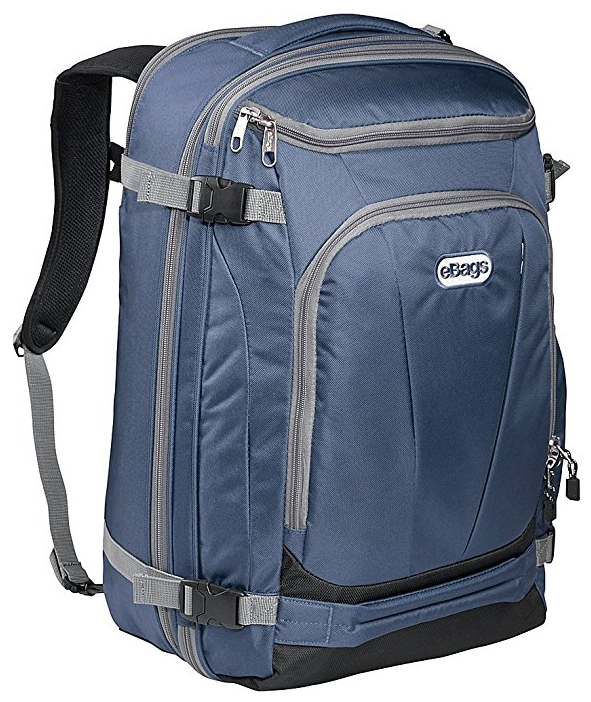 For me, this question is “Does this carry-on backpack come with a pocket for my laptop?” Or a tablet. Never mind. Anyway, this pocket should be well-padded to keep your device safely. Clear and mesh inside pockets allow to find your necessities very quickly. 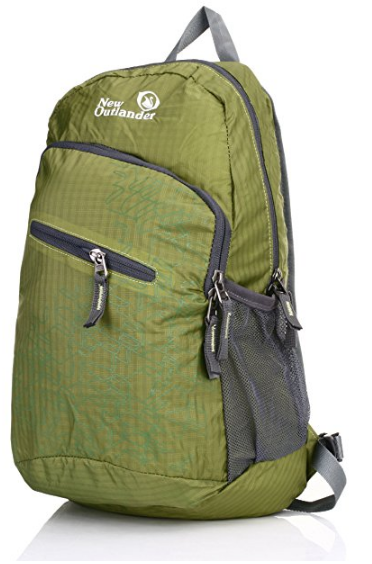 This carry-on backpack is made of 840D and 900D twisted polyester. This material is rather durable. The main compartment comes with a padded divider and two adjustable straps. They allow storing all your clothes perfectly. It has a pouch where you could accommodate a laptop. The external compartment on the front has plenty of pockets for the best organization of your valuables. Maps, a phone, pens, tickets, wipes, all that could be placed there. There is also a pouch for carry-on liquids. All zippers are rather firm and slide softly. The blue, solid black, eggplant, green envy, red, light blue and graphite colors are at your disposal. The backpack is very stylish. Please note, whatever color you choose, the interior of the backpack will be bright orange. There is a big mesh pocket at the top of the backpack on the inside. It is suitable for storage of not too cumbersome things. The carry-on backpack is not waterproof, but you can carry it in damp weather with ease. The shoulder straps are padded for your comfortable carrying. They are sewn sturdily. The backpack meets all the carry-on requirements. This is the best travel carry-on backpack, and I’m not exaggerating. This carry-on backpack is made of water repellent polyester. Its dimensions allow putting the bag into an overhead compartment. You can also fit it under the seat in the plane. 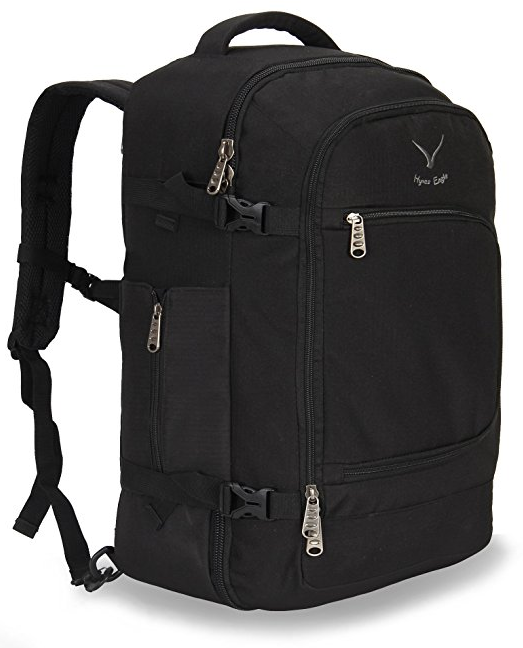 Well-padded shoulder backpack straps could be hidden into inside pocket when necessary. In such a way, a backpack will be transformed into a suitcase. The clasps of the straps are rather sturdy. There is a deep pocket on the side of the backpack for a water bottle or a thermos. Two handles, at the top and on the side of the bag are meant for a quick grab. The main compartment is spacious, and it could keep a lot of your clothes and other things. One of the compartments has two padded sleeves for a laptop and tablet. They will store your valuable items securely. Put your tickets into a zippered pocket at the front of the carry-on backpack to take it out without wasting time. These carry-on backpacks by Hypes come in the gray, black and purple colors. Cabin Max offers very bright and jaunty carry-on bags. You will never lose such a bag anywhere thanks to its dappled design. Besides, your travel companions will not lose sight of you in a crowd of passengers. Air balloons, abstract spots, famous places, enigmatic herbs, funny prints, polka dot, even a map of the Earth and dozens of other designs will make your journey as pleasant as it could be. Carry-on bags by Cabin Max are made of water resistant six-hundred denier material. The back of the backpack is padded for your comfortable carrying. The carry-on bag has three main compartments. Each of them has a strong zipper. Two internal pockets are zippered as well. Some of the inner pockets are mesh, which means you could find any of your personal items very quickly. If you’re planning to buy a secure lock, do note that some models come with tiny padlock holes. A perfect backpack for any trip. I dare say, this is one of the best carry-on travel backpacks. 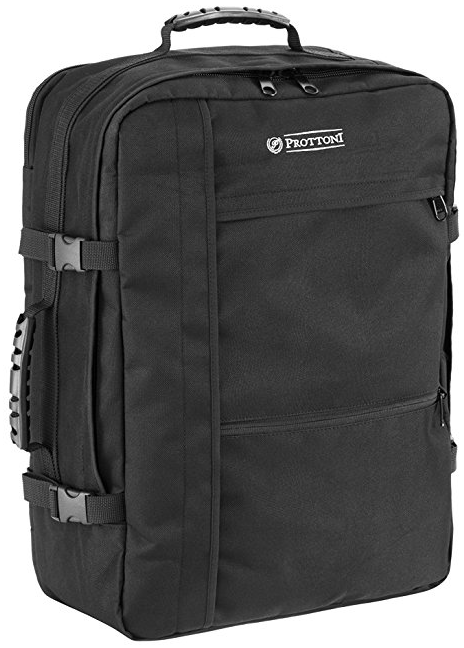 This is a premium travel bag from Prottoni. The bag is made of a durable polyester. Its linen is made of PVC, which makes the bag water-resistant. The sizes of the carry-on backpack allow to take it to the plane. Either of the sides has straps with clasps for perfect storage of your belongings. All zippers are heavy duty. The bag has a padded back support for your comfort while carrying. The carry-on backpack has a large main compartment, where all of your clothes, toiletries, and other essentials could be placed. The main compartment has straps, which store the clothes neat. Numerous zippered pockets are at your disposal as well. There are two sturdy handles on the top of the backpack and on one of the sides. Thanks to the ergonomic design of the handles, it is comfortable to carry the backpack in hand. An adjustable sternum strap helps to lock the backpack on the back and keep the backpack from shaking. You can make a suitcase from this backpack with ease. Just hide the shoulder straps inside a sleeve, and that is all. This is the most lightweight backpack. It is very light when empty. And it remains light when packed, too. Despite its dimensions, the backpack is roomy. All your essential items could be accommodated there. Water resistant nylon fabric the backpack is made from provides the best storage of your belongings. You can carry it in a light rain. This carry-on backpack is a perfect choice for travelers who do not want to carry a lot. Its straps are adjustable and made of a breathable material. The bag comes in the stylish black, green, red, pink, blue, orange, purple, and gray colors. Feel free to choose by your taste. 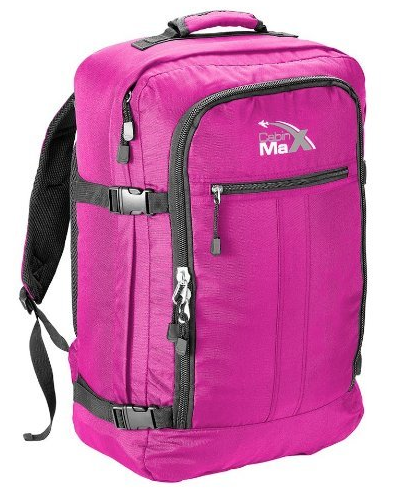 Besides, this ultra-light travel backpack can be used not just for weekend getaways, but as a diaper bag, too. It allows to free your hands and not to be exhausted from a trip to the city with your baby. The backpack is well-made and will serve you for a long time.